I’ve owned my Getzen 3850 for the last 3 and a half years and It has been a pleasure. Because this is my only instrument, I really got to know the instrument inside-out. Also during my time with the 3850 I’ve had the chance to compare it with other instruments and try many different types of mouthpiece combinations. I’m not simply a trumpet player who plays the cornet once a week or once in a blue moon, the cornet is my main horn and I play it exclusively. I have no desire to play anything but a cornet. The only way I would play a trumpet is for me to get paid, but I don’t mind hearing a well played trumpet. I checked out a couple of other cornets before I decided on the 3850. In the end, it was the 3850s tone that sold me. Its tone matched the sound concept that I had in my head and all I had to do was just work on the other areas where I was having issues. 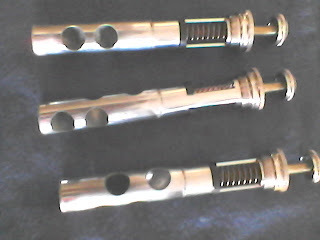 The main culprit of my problems was the need to fix everything in a hurry, by swapping mouthpieces at an alarming rate. The cornet is the kind of instrument that can trick a potential new cornetist into trying all the tricks in the book in order to get a desired instant result. The problem with this is that there is nothing that is an instant fix with a cornet. You simply must spend time with the instrument before you make any drastic changes to your, equipment, style, approach, and technique. This is a common problem with people who transition from other instruments, and mainly the trumpet. 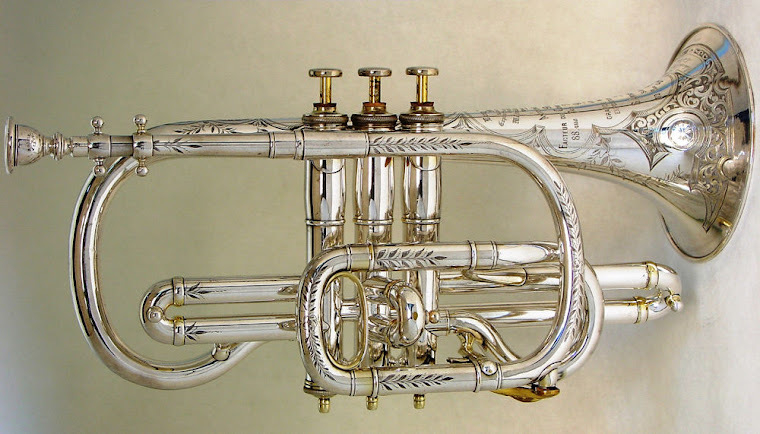 If you plan on ripping off double high Cs, at double forte, you are going to be in for a rude awakening because the cornet is an instrument that requires finesse instead of power in order to make it sing. After I realized that the mouthpiece safari was hurting my efforts, more than helping, I made the decision to just stick to one mouthpiece no matter what happens. The key to this is again picking the right equipment that can help you accomplish most of what you want to do. Eventually, I chose the Denis Wick 2b and I have been pleased with the results. When I first received my 3850 I was very impressed with its fit and finish. The horn looked as if it was carved out of a solid piece of brass and it was built like a little tank. The fit and finish was spotless, and because mine was clear lacquer, it looked as it was meant to display in a museum instead of being played. Whenever I play the horn in public the comments are usually about how nice looking the horn is before I would even play a note. When I bought my cornet I also had a Kanstul Chicago 1001 trumpet that I compared to my cornet immediately. The first thing I noticed was how heavy the horn was comparison. The Kanstul 1001 felt light as a feather when compared to my 3850. The 3850 does not feel flimsy at all. There have been times when I bumped my cornet into a table or music stands and then frantically searching for any dents, only to not find any at all, to my relief. 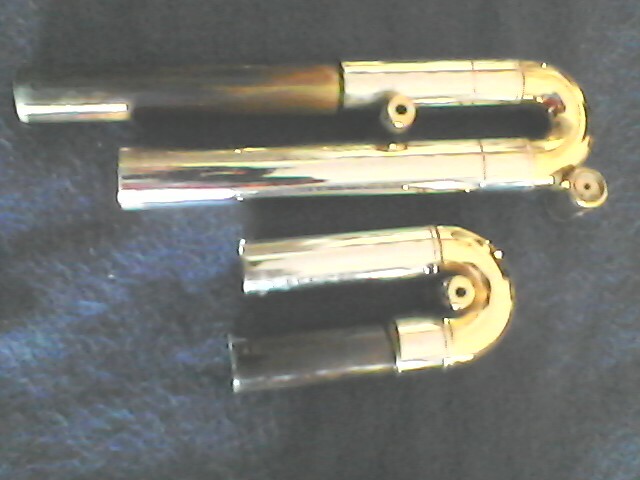 One major difference with the getzen 3850 when compared to other cornets is the spit valves. 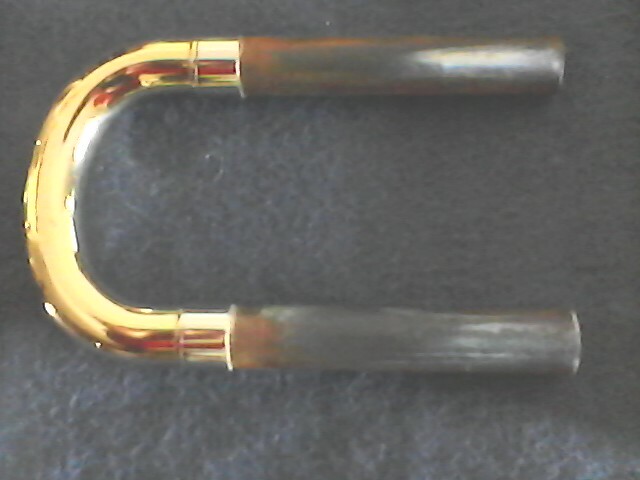 Amado water keys are standard on the 3850 instead of the standard lever type spit valves on most brass instruments. Allot of people hate the amado water keys and complain about them not emptying all the condensation out of the instrument. In fact excess condensation is one of the main gripes about the 3850. I actually like the amado water keys and grown to prefer them over the standard spit valves. Again this is the only horn I own and I figured out a way to get around the excess water issue. If I want all the water out my horn, I tilt the bell down 45 degrees, at the same time making sure that the amado keys are closer to the ground than any other tubing and press the button and blow air through the horn. With practice I learned to remove all the water. Getzen is well known for its fantastic valves, and as far as I’m concerned they deserve the reputation. The valves on my 3850 are simply outstanding. At first I thought nothing could beat the valves on my Kanstul but I was totally wrong. This is in no way a negative hit on Kanstul, but the valves on my getzen are just that damn good. 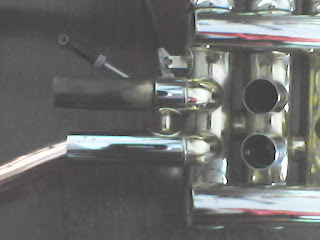 The valves on my Kanstul were light and fast, but the Getzen had one extra benefit.… They were insanely smooth and they didn’t make any extra noises, except that pleasing soft thud when they hit the stops on the inside of the top valve caps. The getzen valves felt more substantial whereas the Kanstul valves were so light and fast that they felt as if I were not pressing any valves at all. Also I feel that the 3850 gave more feedback to me as a player. The entire horn seemed to resonate when played. The 3850 has a smaller bore than allot of other cornets being manufactured today. 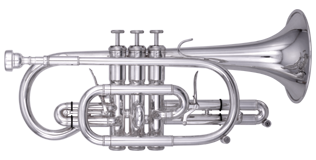 The bore is .462 However, there are many trumpets and cornets manufactured today that have larger bores than the Getzen 3850. When buying a cornet, one must remember that the bore size is just one of the designs features that affect the way a cornet plays and sounds. You can’t judge how a cornet will play just by bore size and speculation from critics alone. Put the horn to your face and use your own judgment. 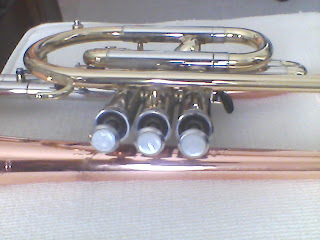 When I first bought my cornet I had a 16e Yamaha short shank cornet mouthpiece. The mouthpiece didn’t fit snuggly into the receiver, but with a little scotch tape, I was able to make it fit snug enough to play. The sound was just so rich and silky and I Was able to make the horn do anything I wanted, but when I played in a live jazz session I couldn’t hear myself. When I tried the 3850 with the Dennis wick 4b clone that came with my 3850 I wasn’t happy with the tone at all but the projection was allot better than the Yamaha. When I played it, my tone was airy and fuzzy and I was exhausted after about five minutes of playing. I didn’t like the wick clone at all. I just couldn’t handle that huge open throat at the time. The horn was so open and free blowing, that I thought my entire face was going to go through the horn and come out of the bell. 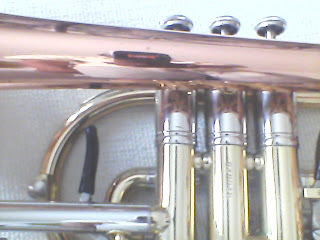 Today when I play on my Denis Wick 2b I have no problem at all playing above the staff, and the horn just feels perfect for me and what I want to do. 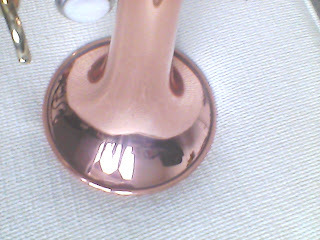 My getzen also features the standard one piece copper bell. The tone I get from my 3850 when I use my wick 2b is just incredible. It can be extremely rich and mellow, but not like a flugelhorn. It can also be brassy without sounding like a trumpet wanna-be. Another thing that I enjoy about my setup is that I have all the power, projection and range that I need. Because I’ve been playing the same mouthpiece for a year I’ve grown into it. The instrument plays evenly and slots very well from pedal F# all the way past high C. The tone is cornetish all the way to the extremes of my range. I personally don’t like to go above high C. Cornets seem to loose their characteristic sound above high C and start sounding more like trumpets unless you use a huge mouthpiece like a wick 2b. Instead of sounding like a screaming cat above high C, my 3850 sounds refined like trained female vocalist. When I first started to play the wick 2b with my 3850, I noticed that I had a hard time tuning with other people and I had to push my tuning slide almost to the stops in order to tune the horn. Tuning with other people was damn near impossible for me above the staff. Now that my chops are stronger, I have no problems at all with tuning. Also with the added benefit of the first and third valve triggers keeping the 3850 in tune is a non issue. I also like to use the triggers to bend the pitches a little just to add a little subtle spice. Overall the 3850 is an excellent cornet, and any serious cornet player will be doing themselves an injustice if they do not give one a try. 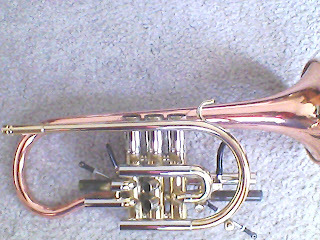 Getzen could have added another 1000 dollars to the price and I still would have bought this cornet. 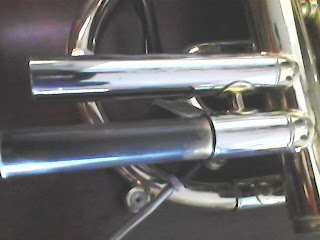 The more I play the cornet, the more I notice the way it affects people. I was at a friend’s house the other day and some of his old friends from the past dropped by. My friend is in his mid seventies and I go to visit , check, and spend some time with him about once a week. Anyway, when I go to visit him, he always wants me to play some passages out of Arbans and play along with some R&B recordings. This time around, he asked me if I could play something for his friends, because they had heard a clip of me practicing and they couldn't believe that I was playing an instrument. They thought that I was singing instead of playing a horn. There is something about the tone of the cornet that is definitely voice-like. I’ve been working on bringing more of that quality out during my playing. It has the kind of tone that we humans can immediately recognize when we here it. Lately , I’ve been checking out allot of vocalist like Sam Cook, Smokey Robinson, Nat King Cole, Marvin Gay, Minnie Riperton, and Whitney Houston. The great cornet players of the past used to imitate opera singers and the like and I figured why couldn’t I do the same. Sax players do it all the time so why shouldn’t cornet players exploit the cornets talents in order to imitate the great vocalist too. My goal was to study and translate the great vocalist ,listed above, and incorporate their soulful inflections and style to the cornet. Who said that we always have to be stiff and formal? Music is supposed to be a form of communication and not some mundane task duplicated over and over. Before I could do this, I needed to learn how to seriously lay back on the cornet in order to get that soulful human expression that only the cornet , in my opinion, can imitate. When I mean lay back, I mean not being to ridged or predictable. Everyone expects the jazz musician to swing and not play exactly on the beat which is something that can be easily taught and learned. Everyone expects the classical musician to remain true to the piece. But playing soulful is just another thing all together. Playing soulful is the kind of stuff that can’t be written down with notes, taught with a manual , and instructional video, but it is definitely there. It is something that must be within the cornetist and it is unique to only that cornetist. It’s like noticing the wind. You cant see it but you can feel it as it brushes up against your face, as it rustle the leaves, kick up dust and hear it interact with objects as it goes from here to there. As long as cornet-players do their best to exploit the unique abilities of the cornet , it will make a comeback. However, it is a slow process. Most of the new cornet players are transitioning over from trumpet and playing it only as a second or third choice behind trumpet and flugelhorn.. I hope to see a day when the cornet is a first choice. It can happen because there are more people than with the last few years rediscovering the cornet. This is a hot button topic and one that will never go away. 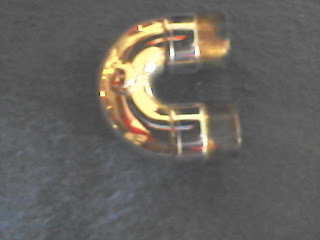 Buying the perfect cornet mouthpiece, I made allot of costly mistakes during my search for the perfect mouthpiece. I have a collection of them sitting in a case and most of them I don’t play anymore. Every day, they remind me that I went about my search the wrong way. This kind of thing happens when information about a subject is clouded in mystery, hearsay, or just mingled in with other similar information you can care less about. When I first bought my Getzen 3850, I ordered a Yamaha 16e. The weird thing was that they were both delivered to my house on the same day. I thought it was a sign. 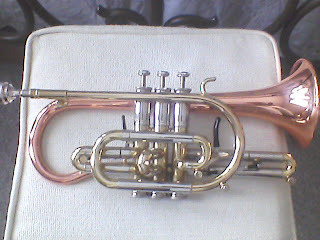 The Cornet was delivered by UPS and my 16e was dropped off by the Uncle Sam Postal Service, only fifteen minutes later. Like so many others potential cornet players, I did my research and listened to the great cornet players produce the traditional rich cornet sound. Reading how most of them used big deep V cornet mouthpieces, I decided to get one of the biggest mouthpieces out there. It was also the same brand and same cup diameter of my trumpet mouthpiece. In my mind I knew that I was making the right decision. Boy was I wrong… I basically ignored the Denis Wick 4b clone that came standard with my Getzen. I think I may have played it twice before sticking the Yamaha into the lead pipe. The Wick clone had a nice sound but I did notice that I was producing a little of hiss and was turned off. After that short trial period, I stuck my 16e into the receiver of the 3850. The first thing I noticed was that the mouthpiece wasn’t seated properly. It moved around, almost like a loose tooth. Thinking to myself that I just spent some hard earned money on this thing, I’m going to play it anyway. It was tight enough in the receiver to play. When I played my cornet for the first time with the Yamaha, it was almost as if the gates of heaven just opened. The sound was stunning. Thinking that I had the right mouthpiece, I searched for and found scotch tape. After taping a piece of tape to the shank of the 16e it had a nice snug fit. 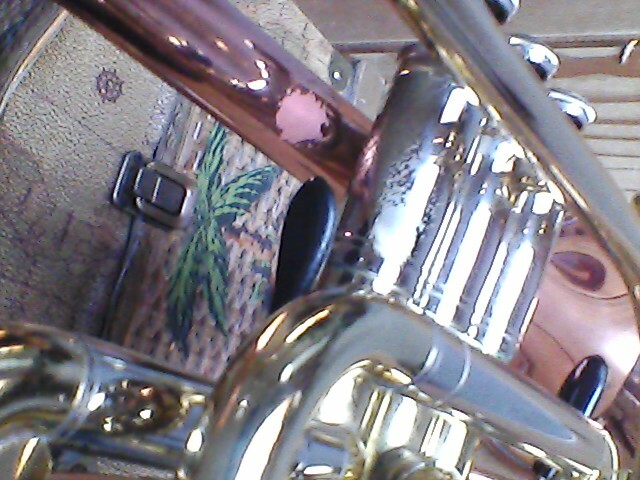 I commenced to getting to know my horn, after remedying my mouthpiece fit problem. Later, with three months of daily committed wood shedding I decided it was time to pay a visit to one of the local jam sessions. I wanted to make my self known to the world. When I arrived at the jam session, I introduced myself to the bandleader. He was welcoming and curious about my cornet. I played “Round Midnight”. Judging with my own ears, approval from the band, and the applause from the crowed, I thought that I did a decent job. After sitting down, I managed to rustle up a couple of business cards from a few of the attending musicians. 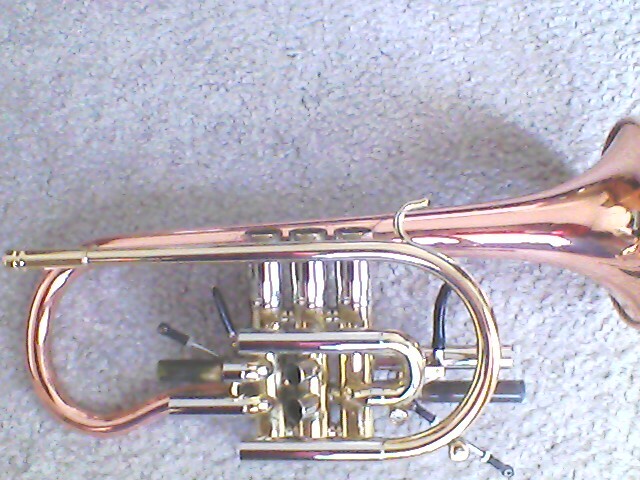 The main topic during my conversations with them were centered around the cornet and about how nice it sounds and looked. About a half hour later, I was called back to the stage. The chart was “A Night in Tunisia “. Because I was the guy who showed up with the cornet, I was given the honor to solo first, after playing the head. 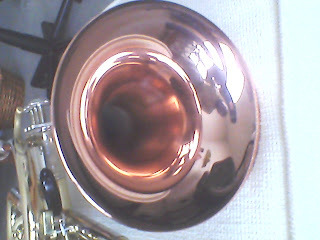 When I played “Round Midnight “The band left allot of space for me to make the cornet shine in its special mellow way. All I had to do was just sit back and let all that mellow ear candy flow. However, for “Night In Tunisia” it was a different story. This time around the band was more intense. The drummer and keyboard were pushing allot of sound and the room was packed. There was a tenor sax and trumpet player on stage with me and they let me know they were going to add horn lines at the bridge, when it was my turn to solo. Noticing that I couldn’t hear myself while everyone was playing through the head, to compensate I played louder. I could tell that my chops were getting tired. Concern and doubt began to creep into my mind about me being able to complete the changes. It was getting so bad that I wasn’t concentrating on the changes. Eating the microphone with the bell of my cornet didn’t help either. I still couldn’t hear anything. Exhaustion kicked in after blowing through the changes just one time. My chops were giving up the ghost. I couldn’t wait for the next run down the head to end. There was no way I was going to do three. At the end of my solo I backed away from the mic and accepted the applause from the audience. I wasn’t happy with my performance and I new there was something I had to do. I new I could do better. As musicians, we go through the halls of self doubt more than once through our careers. My self doubt led to insecurity and eventually a downward spiral. From then on, week after week was the same result. It didn’t matter which club I played. Ballads worked great, but in situations where more volume and power were required I had serious problems. I wasn’t sure about anything. Regret about selling my Kanstul 1001 Chicago begun to set in. I feared that all the comments stating that the trumpet is better for jazz than cornet were true. Thinking like a new cornet player, I decided to take the quickest route to fix my problem. The mouthpiece safari was the way I decided to go. Eventually I learned that the only things mouthpiece safaris were good for is messing up your chops and paperweight accumulation. Every week ended with a new mouthpiece after every bad performance. Please see Taking the Plunge As A Cornet Player for more. I finally learned that choosing the right mouthpiece for your cornet is pretty simple. This is not as big as a mystery as some make it out to be. The first thing you want to do is think about the type of sound you want your cornet to produce. Notice I didn’t mention where you are planning on playing your cornet. This is on purpose. Some guys like a mouthpiece for every venue. I am from the one-mouthpiece-for-everything camp. One nice feature of the cornet is that you have a wide sound envelope. It can sound almost like a flugelhorn or almost as bright as a trumpet. The fitting of the mouthpiece into the cornets receiver is the second thing to consider. This may sound pretty obvious, but you will be surprised about how many cornet mouthpieces don’t fit your cornet. During my safari, I bought a Yamaha 16C4 for my Getzen 3850 and it wouldn’t fit my cornet. 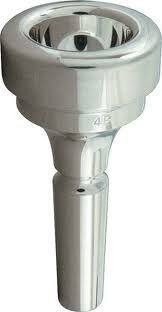 The third consideration for buying a cornet mouthpiece is how hard it makes you work for your goals. If you can accomplish 75% of your goals and concentrate on the other 25% where you are weak, your probably going to be happy cornet player. When I finally made the decision to buy a Denis Wick 2b I knew that endurance was going to be an issue. The features that sold me were the cup size, huge throat, tone and power. I always played on large mouthpieces, even when I played trumpet. 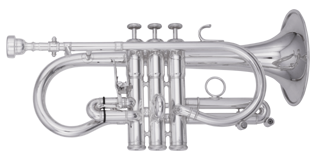 I have greater flexibility with a large diameter mouthpieces and I don’t worry about hitting the bottom of the mouthpiece. All I had to do was just work on my endurance. The forth consideration will be how much time are you willing to spend on one mouthpiece, before you see your desired results. Part of the problem with mouthpiece safaris is the temptation to hop from one mouthpiece to the next searching for instant success. Don’t expect to be able to play everything perfectly, just because it is your new magic mouthpiece. The magic mouthpiece does not exist. Don’t believe the myth. The magic is in your practice. Your must spend time with your mouthpiece. When I brought my Wick 2b. I made the decision to play that one mouthpiece only. I did it for a year. Now I have no problems at all with endurance. 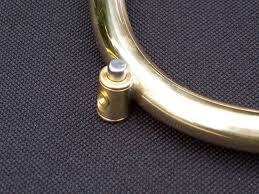 The last thing to remember when buying a mouthpiece for your cornet is to not bow to peer pressure. Most people like to purchase something based on information from a trusted source. Each one of your cornet mouthpiece advisors has their favorite mouthpiece. They are going to naturally tell you how great it is. If there was a mouthpiece that one of your advisors doesn’t like, trust me, they are going to let you know every bad thing about it. Pick the mouthpiece for yourself don’t let others pick the mouthpiece for you. Try out a mouthpiece you never tried before. 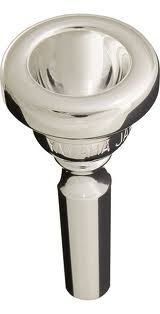 My favorite trumpet mouthpieces were Schilcke and Yamaha and I tried them first, on my cornet. I let opinions of a couple of advisors turn me away form Denis Wick. I’m glad I finally made the decision on my own. In the end, like me, you’re going to be the one who makes the final judgment about what piece you’re going to get. The day before yesterday I was a wounded cornet player. My right hand got slammed in a door and I thought that it was broken. It swelled up to almost twice its size and I could barely move my fingers without my hand feeling like it was about to break in two. Because we cornet players use our right hand to press the valves, this was a big problem. I needed to get in my usual amount of hours of practice in, but the pain was almost great enough to stop me. I did everything to make the pain go away except pain killers and pills. I’m the type of musician that feels guilty if I don’t put in a certain amount of hours of quality practice. At the bare minimum I will do 3 hours, broken up into 3 1hour sessions. Six hours is great when I get the chance. Today I feel real guilty. I had the choice to go to the emergency room or see the doctor and neither were a good option for me. I didn’t have time to waste sitting around in some doctor’s office with a bunch of other people who are probably worse off than me. I decided to fight the pain and managed to work through it , by practicing long tones and lips slurs. It was good quality practice and I didn’t feel guilty in the end. Today the swelling in my hand is down and I can move my fingers. My hand still hurts a little, but I don’t think that it is broken. What Makes a Cornet a Cornet? Cornet Anderson. Travel theme. Powered by Blogger.